Twenty years ago next April, after a century resisting the idea, the UK Government finally brought in a compulsory minimum wage of £3.60 an hour. That’s either £5.30 or £6.20 an hour in today’s prices (depending on which inflation index you believe). This felt pretty low, but at least outlawed the lowest wages paid in sweatshops. If, on the day in 1999 that the National Minimum Wage was introduced, you’d told me that campaigners two decades later would be using our research to advocate a ‘living wage’ about 50% higher than this, I’d have been pleased but not optimistic about their success. If you’d said that over 4,000 employers ranging from the Scottish Government to IKEA would by then have committed to paying this rate, I’d have been somewhat incredulous. But if you’d told me that a Conservative government would have taken up the idea of such a Living Wage, leading to a 26% increase in the compulsory minimum for over-25s in the space of four years, with ambitions to raise it further, I would have taken another look at the calendar, and realised it was April the 1st. And here’s why the next two or three years will be crucial. This gap between the compulsory NLW and the real, voluntary UK Living Wage has actually been shrinking considerably in recent years, as seen in Figure 1 (the zig-zags are caused by the two levels being uprated at different times of the year). By next April it will have halved in four years to below 80p an hour: for the first time falling below 10%. 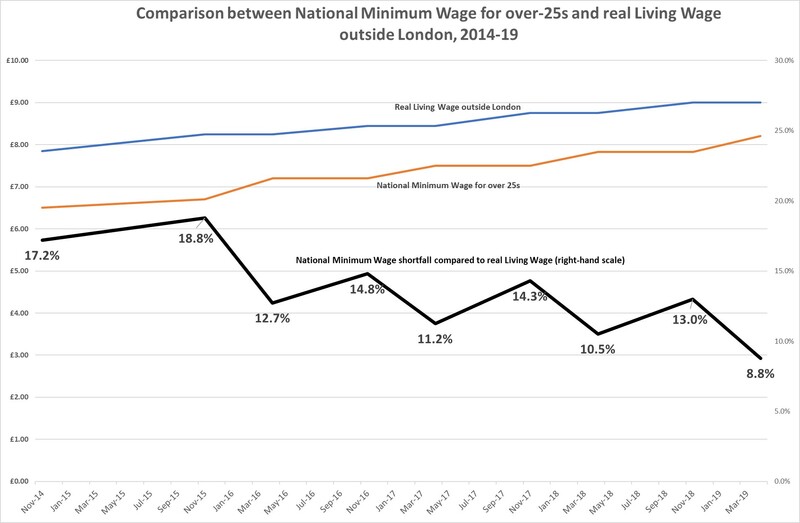 If you only looked at this graph, you might think that within a couple of years the Living Wage Foundation’s main job will have been done, although they will still need to campaign to rectify the wider pay gap for those on the minimum in London and for under-25-year-olds. But the policy that has caused this convergence, the Government’s commitment to raise the NLW to 60% of median pay, will be completed in 2020. After that point the original aim was to peg it at that 60% rate. The risk is that even if such a commitment is kept, NLW recipients could become worse off again if living costs rise faster than median pay rates, which can happen in an economic downturn. Yet last week saw another twist to the story, which would have seemed even more mind-boggling to my 1999 self. In considering in his Budget what would come next, the Chancellor expressed the ambition of moving the NLW from 60% to two-thirds of the median wage (the threshold of ‘low pay’ as conventionally measured) in due course. This further ambition would not only fix a compulsory ‘pay floor’ higher than for almost any other country, but by adding nearly £1 more to its level would under present conditions move it slightly above the real, voluntary rate. But unlike the plans for its first five years after George Osborne announced the NLW in 2015, this is an ambition rather than a political pledge. By undertaking to consult the Low Pay Commission, which looks closely at the economic effects of increases in the compulsory minimum, Phillip Hammond is once again changing the rules of the game. This is sensible: you can’t go on legislating higher pay forever without regard for whether employers are willing and able to create jobs that pay it. Now is a good time to tread cautiously, testing whether convergence between minimum pay rates and minimum worker needs is feasible without creating an unacceptable rise in unemployment. This is likely to mean more gradual increases in real minimum pay rates than have been seen in the past three years. But the fact that this is being done under an officially-endorsed project to end low pay is an extraordinary development. And the voluntary campaign to adopt a living wage will continue to play a crucial role in holding government and employers to this ambition.